When configuring discounts and setting the Discount concurrency mode, you have the option to choose Exclusive, Best price, or Compounded. The question presented when ringing up POS transactions is which one takes precedence when you have multiple discounts that are applicable to the same sale? This article will provide you with a brief explanation on the precedence of these configurations. 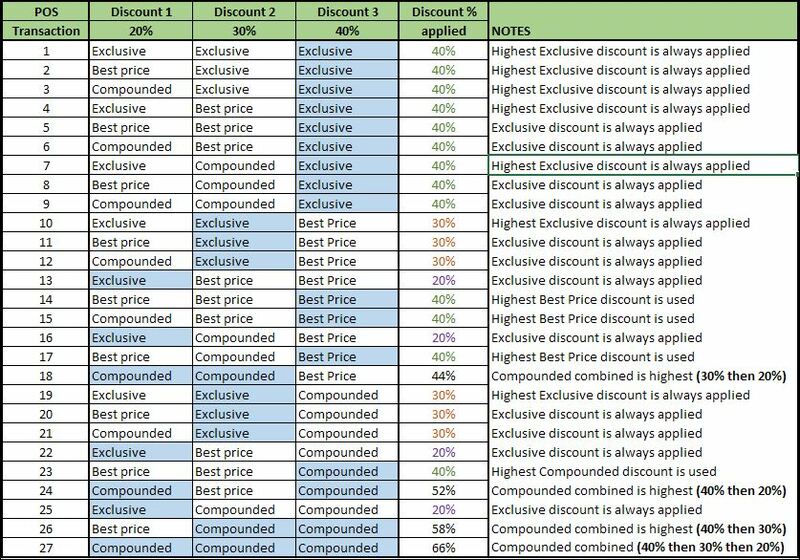 When multiple Compounded discounts are applicable, the highest discount will always calculate first. The next highest discount is then calculated on the remaining amount. This calculation hierarchy will continue until all applicable Compounded discounts have been applied. Exclusive discounts will always apply over a Best price or Compounded discount, even if it is the lowest discount percentage. When more than one Exclusive discount is applicable, the highest will be used. When Best price and Compounded are both applicable or if multiple of the same one is applicable, the highest discount will be used. Now that we have covered the basics, let’s take a look at a transaction matrix consisting of 3 discounts (20%, 30%, and 40%) for each transaction. Each Discount will be configured with 1 of the 3 concurrency modes. We will then determine which discount is applied to the transaction based on what we know about the discounts in the information provided above.